Not to be outdone by Paramount’s recent decision to remake 1991 soap-opera satire Soapdish, Warner Bros. has announced it’s moving forward on a remake of 1992’s The Bodyguard, having apparently held its own meeting to see which early ’90s films its staffers could remember, and then settled on this over redoing King Ralph because Universal actually owns that one. 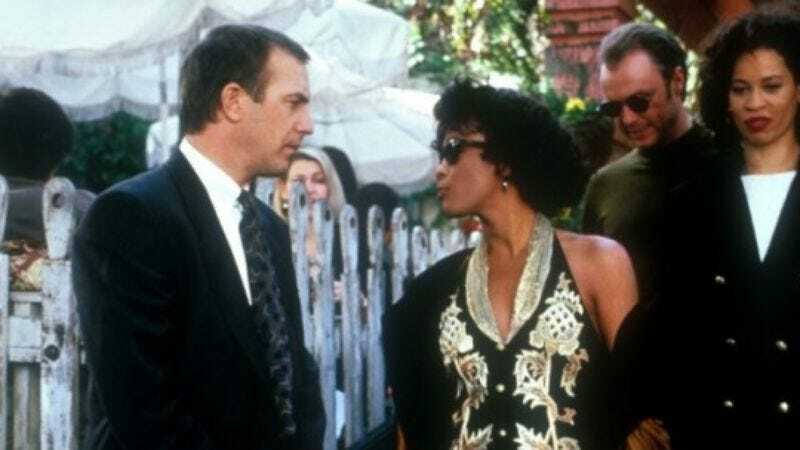 According to Deadline, the original Bodyguard, in which Whitney Houston is relentlessly terrorized into always loving Kevin Costner, will get a 2.0 upgrade, making the Costner character an Iraq War veteran whose first job upon returning to American soil will be protecting a demanding pop star in the age of “Twitter, Google Maps, and TMZ,” and trying to rein in his natural, Iraq War-bred instincts to just shoot all of those things. Because you can’t just go around shooting Twitter. As with the first film, the new Bodyguard is looking for a “young female singer with global appeal” to fill the Houston role, so unfortunately all fantasies of, say, Dwayne Johnson curling Justin Bieber into his chest like a protective Papa Bear and ferrying him to safety across a throng of paparazzi will have to wait for nighttime. And of course, one of the most obvious choices, Beyoncé, is already working on Warner Bros.’ other musical remake, A Star Is Born. So now the race begins to see who can come up with the wackiest random star/protector combinations—Lady Gaga and Mark Wahlberg! Miley Cyrus and Ice Cube! Taylor Swift and Meshach Taylor!—before they just end up putting Channing Tatum and Rihanna in it or something.